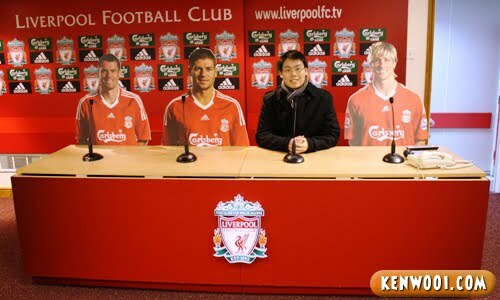 Besides visiting Manchester United’s Old Trafford while I was in UK, I also visited Liverpool’s Anfield Stadium. 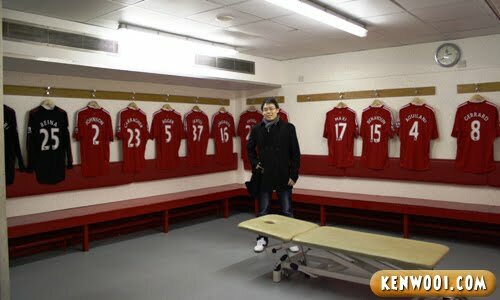 Before that, take note that visiting Anfield doesn’t mean I’m a fan. In fact, Manchester United is still number one for me! Therefore, this entry goes to everyone who is a Liverpool Football Club fan. 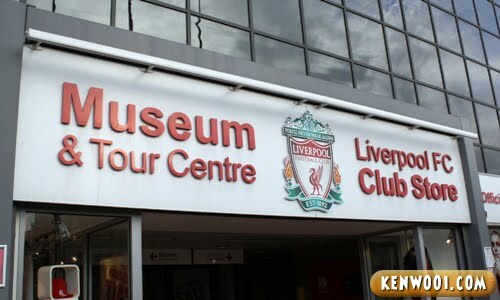 Today kenwooi.com will bring you on another tour at Anfield Stadium. So sit back and wish Liverpool all the best next season. 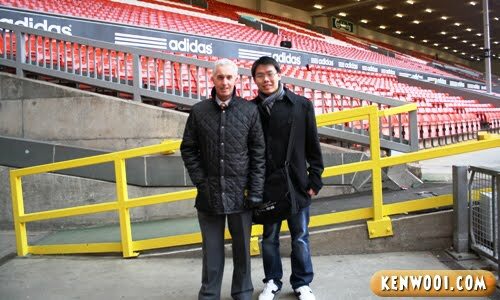 As you enter the vicinity of the stadium, you’ll see a statue of Bill Shankly. He’s a legendary individual (former manager I think) here and it’s said that he makes the people happy. Although I wasn’t a student during the visit, I got student price ticket at ₤8.00 (RM44.80). 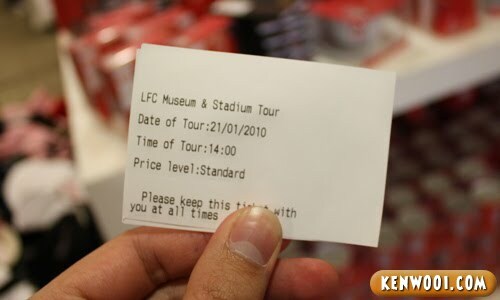 Unlike the cool “tag” given when you buy the tour and museum ticket at Old Trafford, you get a piece of paper instead. Thrifty eh? Anyway, since it wasn’t time for the stadium tour yet, I went to the Club Store to have a look around. 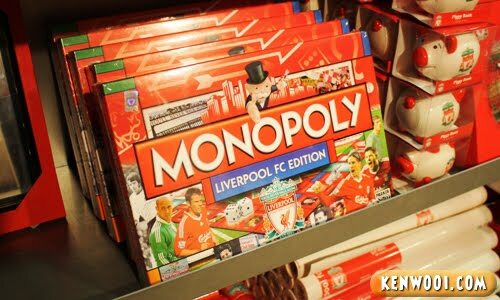 They have interesting souvenirs like Monopoly Liverpool FC Edition. I wonder what will be bought and sold in his edition. Gerrard’s boots and Torres’ hairband? Besides that, they have cosmetics as well. 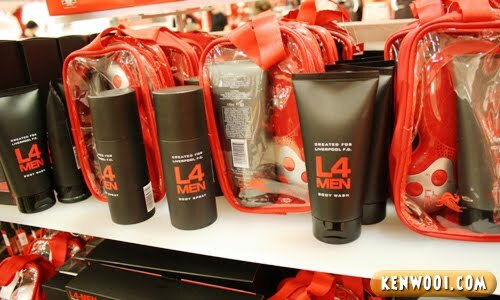 L4Men. Sounds like a facial foam that can make you as handsome as Benitez. Maybe lah. After that I went to the museum as well. Well, I don’t find anything interesting to talk about in the museum. 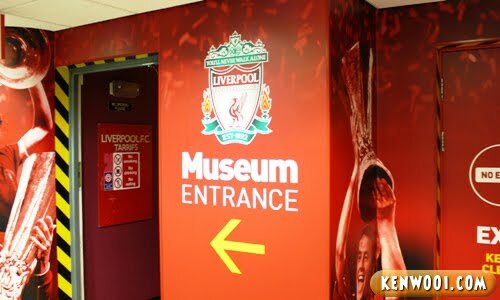 Maybe only Liverpool fans will be fascinated by the exhibition. But I find this poster interesting. Winners? Well, not quite anymore I guess. After waiting for quite some time, the stadium tour began. To be honest, Anfield is not as huge as Old Trafford. I went “Wahhhh!” when I saw Old Trafford for the very first time. Anfield, however, just an “Oh…”. The first place we were brought to was the dinning room. This is where the players eat, obviously. 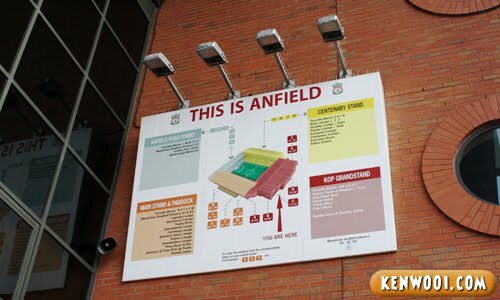 And yeah, welcome to Liverpool Football Club and this is Anfield. 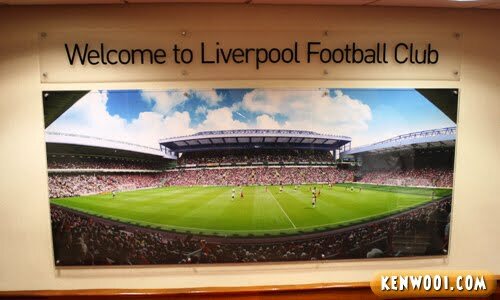 According to the tour guide, that “This is Anfield” poster is used to intimidate the opponent before they exit to the field. Michael Owen used to jump and hit it every time during matches. This is the pitch. From inside, the number of seats available here is definitively not as many as Old Trafford. 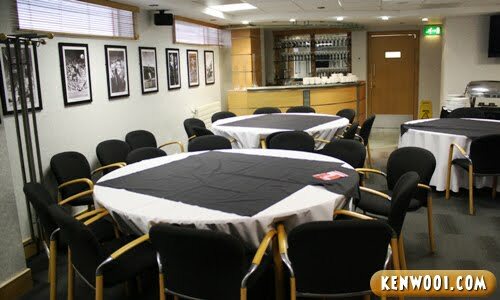 Then, the press conference room where we met some of the footballers and their future manager. Yeah, Liverpool players like Jamie Carragher, Steven Gerrard and Fernando Torres. Anyway, next we were shown the changing room. Display of jerseys as usual. Other than those mentioned, we were shown the interview area and more of the pitch only. 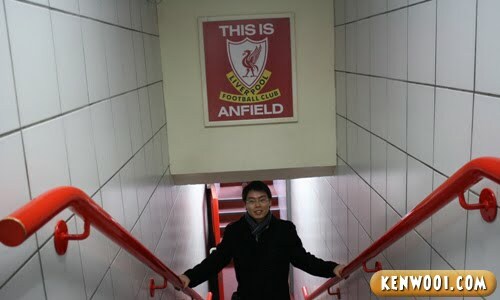 And that sums up the Anfield Stadium tour. By the way, this gentleman was the guide during the tour. When I asked him for a photo together, he said “I’m not sure why you want a photo with me, but very well!”. Never thought i will be…but i am the 1st today!!! Manchester United forever !!! that This is Anfield poster is kinda intimidating . lol! nice one! :D “Waaaa” and “Oh” so big diff aye! :D tot u big fans of MAN U , how come be the future manager for Liverpool??? hahaha! Now I regret I haven’t been there…. Handsome as benitez? :p He handsome~meh? hhahahaahha….ehhh they really know how to make money out of the fans leh…..
Add an “I”…and it becomes “KOPI”…and any Malaysian there would think it is a kopi-tiam! LOL!!! “I should have told him “Hey, it’s not anytime you can have a picture with Ken Wooi eh!”. Haha. =P” – – – >> LOL!!!! true true..
silly silly tour guide. I’d totally take a photo with Ken Wooi any day! envy you la ken. got to go to many places around the world. 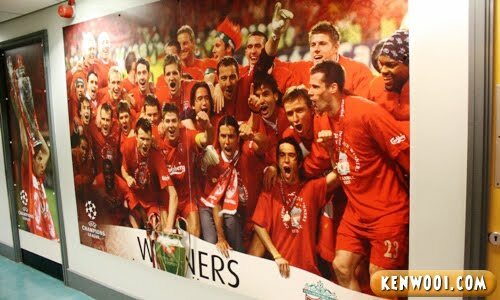 How I wish i could go to Anfield, I used to be a die hard fan for Liverpool (You’ll never walk alone)! You are such a lucky guy~! have a wonderful weekend lucky guy! I may sound absurd here, but “Glory Glory ManUtd”! i think the ticket price is reasonable…you can have tour the whole stadium…how u got student price ticket? Great pictures bro, as always. Witty writing too. Anyways, now we know why Liverpool are not winners anymore. Their stadium is a dump & I think Puchong Rangers would not want to play there….hehehe. Glory Glory Man Utd!!! Man Utd alway the best!! Oh..nice trip to Anfield. But Anfield just can’t compare with Old Trafford..
i am a Liverpool fan even before birth!!! hahaha… Once a Liverpoolian, always a Liverpoolian.. after the memorable 2005 champions league final in Istanbul, won by Liverpool beating AC Milan after coming back from 0-3 down in the 1st half – the taglines were awesome : Mayhem in Istanbul turns into English Delights… Long Live the Reds, King of Europe, Darling of England, Pride of Merseyside… You will never walk alone…. Liverpool forever!!! But Benitez should go – it is time to have the likes of Jose Mourinho and Roberto Mancini and Carlo Ancelotti as new Liverpool manager!!! 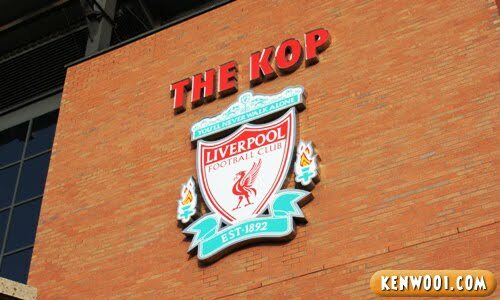 i should visit Anfield one day even im not the red’s fan..
Looks very nice and also a conincidence, I just published a blog article on the Real Madrid club. nice..i used to love liverpool during high school years…these days,i just watch any match my dad tuned in on TV..
how far in advance did u book the tics? i remember them saying there was no stadium tour for like the rest of the mth or sumthing like that when visited – so only ended up in the museum and souvenir shop only. Reading the post here is good enough to say that you are not a Liverpool fan.. hahha.. Your blog is amazing bro. All the contents are interesting. stamford bridge and emirates tak pergi ka?? IM A DIE HARD FAN LIVERPOOL!!!! 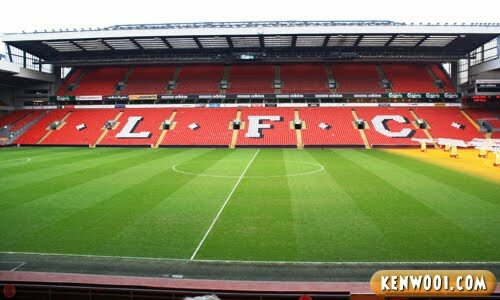 OMG u get to go the anfield stadium… so nice…. im way so jealous…..
Haha wonder if some people believe that the wax figures are indeed real ones….